Cascade Mountain Views from beautifully updated custom home on 19.9 acre with 7.5 acres of COI irrigation for green pastures and livestock. Traditional style home is 4416 sf, 6 bedrooms, 5.5 bathrooms, incredible new kitchen complete with granite counter-tops, knotty alder cabinets, wet bar with wine cooler and new black stainless steel appliances, pantry, breakfast nook, formal dining, living Room with mountain views, gas fireplace, office, family room and master Suite with tile shower, soaking tub and walkin closet on main level. Landscaped yard with covered outdoor kitchen, 2 horse shoe pits, lined pond and wonderful outdoor entertaining. Shop is 4032 sf with pull through doors, 3 bays, work shop, separate gym area, full studio with bathroom, theater room and game room. 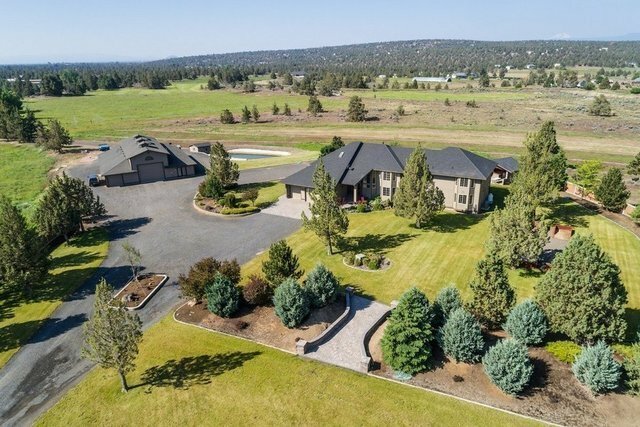 Property is perfect for any Central Oregon lifestyle and is located between Redmond, Bend and Sisters for easy access anywhere!